Josh Clymer has been driving his 2005 Acura TSX a lot. In fact, he says he’s up to 505,248 miles now on the original drivetrain. To celebrate a half-million, he took the car to get compression and dyno tested. That gives us a good idea of how healthy the engine really is. Clymer has been documenting his adventures on his blog “TSX Travels.” Since I am a big fan of high-mileage Hondas myself, I’ve been following his quest to get to the moon and back with this car. Apparently it’s still running well enough to get Clymer all over Idaho on a regular basis, but these diagnostics go a little deeper into assessing the vehicle’s condition. Clymer’s compression test, as per his mechanic. As this seal weakens, you lose power and efficiency. Eventually, if it gets real weak, your engine won’t run at all. 175 psi in cylinders 1 and 2, 180 psi in cylinders 3 and 4. That would appear to be well within spec, as the Acura manual calls for a minimum pressure of 135 pounds per square inch and maximum variation of 29 psi. Now I’m not sure how much internal service this engine has had over its 500,000 mile lifetime, but hopefully Mr. Clymer will jump into the comments and elaborate for us soon. As for the engine’s output, Clymer says his car is putting down 159.64 horsepower and 125.63 lb-ft of torque per the dyno at Motor Mayhem in Meridian, Idaho. The 2005 TSX runs a 2.4-liter inline four-cylinder engine rated to 200 horsepower at 6,800 RPM and 166 lb-ft of torque at 4,500 RPM when new. Of course, no stock TSX would hit those numbers on a traditional dyno, since factory horsepower ratings are measured at the engine and don’t account for parasitic loss that happens as the power is pushed through the car’s drivetrain and wheels. 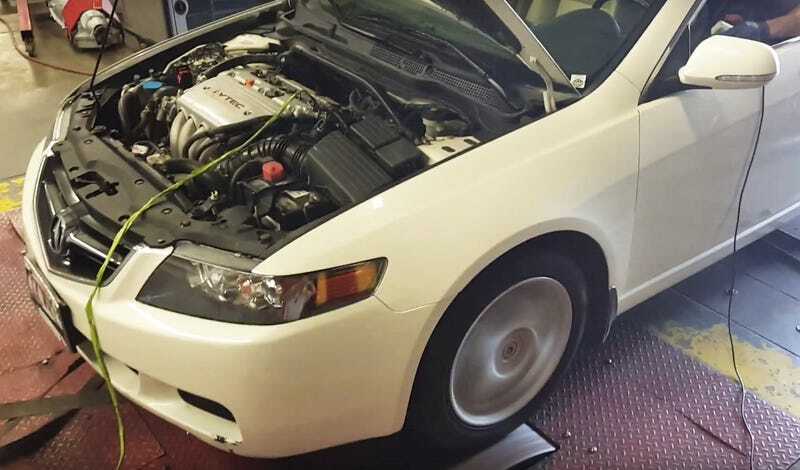 A big thread of user-reported horsepower readings on the TSX Club forum seems to indicate that these cars are hitting between 160 horsepower and 220 horsepower to the wheels with mild modifications like intakes and exhausts. Based on that, I think it sounds like Clymer’s stock TSX is doing pretty dandy for its age. Keep up with your scheduled service folks, and your car just might live forever!